Only three will be crowned. For more information about a candidate, click on a photo above or on a link below. 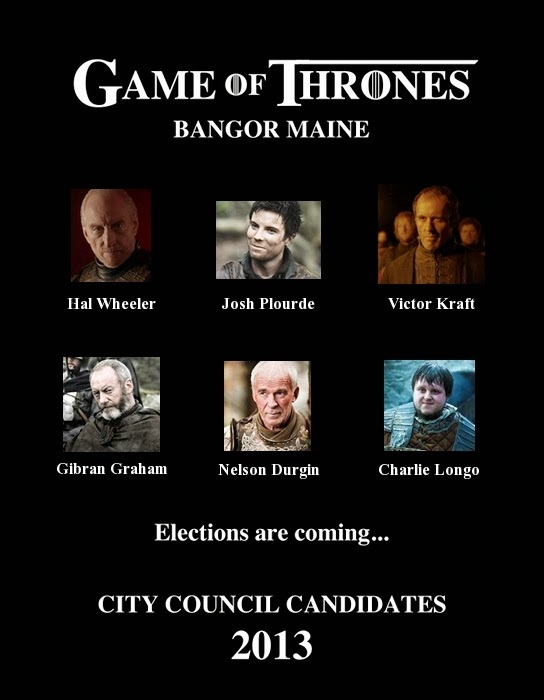 The 2013 Bangor City Council candidates are: Gibran Graham, Victor Kraft, Josh Plourde, incumbent Nelson Durgin, incumbent Charlie Longo, and Hal Wheeler. Hear them speak at the "Words Are Wind" Public Forum! Don't miss it Thursday, September 19th at 7pm in Council Chambers City Hall Floor 3. Missed it? Watch it here. To view a sample ballot or for more information about voting times and dates go to Voting Info & Ballot Bytes.